The William J. Angell Surety School offers expert and comprehensive training for surety professionals with varying levels of knowledge and expertise. This prestigious education program provides an opportunity to establish professional relationships with industry peers. Summer 2019 Surety School will be held at the Hyatt Regency Bellevue on Seattle’s East Side, 900 Bellevue Way NE, Bellevue, WA 98004, (425) 462-1234. Level I - August 4-7 - Provides an introduction to the surety industry and familiarization with the function and process of bonding. Level II - August 4- 9 - Provides an understanding of producer, surety and contractor relationships plus techniques for gathering contractor information and preparation of the case submission to the surety. Level III - August 6- 9 - Provides advanced instruction and discussion on financial analysis and underwriting, marketing and sales strategies, insurance/risk transfer/risk management, and strategic industry issues. This class is intended for the student who has significant knowledge of and/or experience with the subject matter. 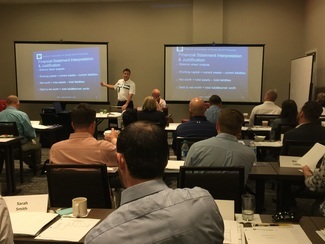 Commercial Surety School - August 6- 9 - Provides a deep dive into commercial surety including legal requirements, underwriting processes, participant roles, and risks across a diverse array of industries encompassing numerous types of bonds. Levels I and II - will be held Jan. 19 - 25 at the Westin Galleria, Dallas, TX. Registration will open in late August 2019. Levels I and II - will be held August 2 - 7 at the Hilton Rosemont Chicago O’Hare, Rosemont, IL. Registration will open in Febuary 2020. "It was an excellent overview of surety! It was great to have all of the different areas reviewed in full. I most appreciated the hands-on experience in working through the financial statements and Work In Progress.” Katharine Snider, Kibble & Prentice, a USI Company, Seattle, WA. "The instructors’ knowledge and experience provided more than just reading about surety. I appreciate hearing about real-life experiences in this ever-changing business.” Angelica Chavez, Surety Account Representative, HUB International Insurance Services Inc., Grand Junction, CO.
“There’s an extreme amount of knowledge in one room. With the various instructors, students and occasional guest speakers, you will encompass a lot of information in a week's time. You will come away learning so much more and be networking with so many individuals who have traveled from other countries and states, says a lot for the prominence of the school.” Lisa Pless, Client Services Specialist – Surety, Willis Insurance Services of Georgia, Inc., Atlanta, GA.
“It will give you a more comprehensive overview of the surety business from both the company side as well as that of a producer. Other benefits are broadening your horizons within the industry by networking with your peers and the ability to tap into a network of established professionals for support in your own career.” Emily Golecki, CCI Surety, Inc., Tampa, FL. For more information on the William J. Angell Surety School, please email prodev@nasbp.org.